I already asked on the AnswerHub https://answers.unrealengine.com/que...-for-tvos.html, but since there was no response I'll try it here I can't get a build & deployment through for tvOS. On OSX I get a "No platform found error". On Windows I'm actually able to build, but the deployment fails. Don't know if it's me that's too dumb or there's something wrong with Preview1 - any hints? I don`t get it. So many people ask how to use those materials so why can`t someone take 3 screenshots for each shading model and put it on the forum? You are writing longer post than making a simple screenshots. We dont need any text Those images will tell us more than enough. Is it locked somewhere deep inside Epic building so no one can have access to it? It would bet that it would took like 5 minutes for just one employee to help a bunch of people here. Seriosuly, just 3 pictures, nothing more. And please don`t provide the link to the Youtube, it will take you the same ammount of time to give as a high res (and without any cropping) JPGs. Intersting; this is something I have to see. So when will we finally have spline-based audio support like we did in UDK? Will we ever get the Wwise Integration Plugin so we don't have to manually build source and integrate Wwise over the course of an entire day? does it means that I can now directly paint by using different materials instead of having to create a unique one with multiple layers? This is awesome! Thank you so much Epic staff for your hard work on UE4! As far as I understand it, it will just allow you to select a set of layers of a single material for every component (one material shared between all components). I think each component can have up to 4 different layers active but currently, the layers are selected "automatically" when you paint the terrain. Last edited by John Vanderbeck; 01-07-2016, 02:20 PM. Still haven't seen any mention of how the VR Stereo Layers (layers, not instancing) feature works. Would love some insight into that. Thanks! Having an issue with Skeletal Meshes. 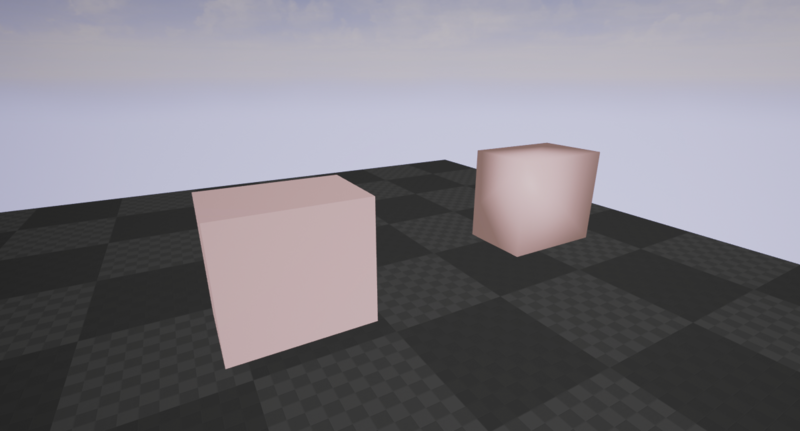 The cube on the left is correct, and is a static mesh. The one on the right is the same mesh imported as skeletal. Notice all the dark splotches? They persist when I disable shadows as well! Whats going on here? Sort of likes like the skeletal mesh has some smoothing or something applied (although the angles are 90 degrees). It is only like this for newly imported skeletal meshes, but the ones I imported before 4.11 look correct. EDIT: It turns out it's a problem with the normals. Switching it from MikkTSpace to BuiltIn fixes the issue. Last edited by Pumpy Bird; 01-08-2016, 03:59 PM. Try reimporting with 'Merge Overlapping Vertices' off. It has to do with the way sharp edges are rendered; in essence, every sharp edge is two duplicate edges connected to two different groups of faces. For whatever reason that doesn't help. I believe the MikkTSpace normal computation has changed in some way. Its some kind of bug, even with proper smoothing groups and all that no combination of settings preserve the overlapping verts besides the one I mentioned. Hi, is there a way you can get them to release screenshots of the materials used for the new hair, eye, cloth shader models from the video link you provided? You can't see the materials clearly in the video. Are the UE4 devs not sharing the material info for some particular reason since 4.11 is not officially out yet?